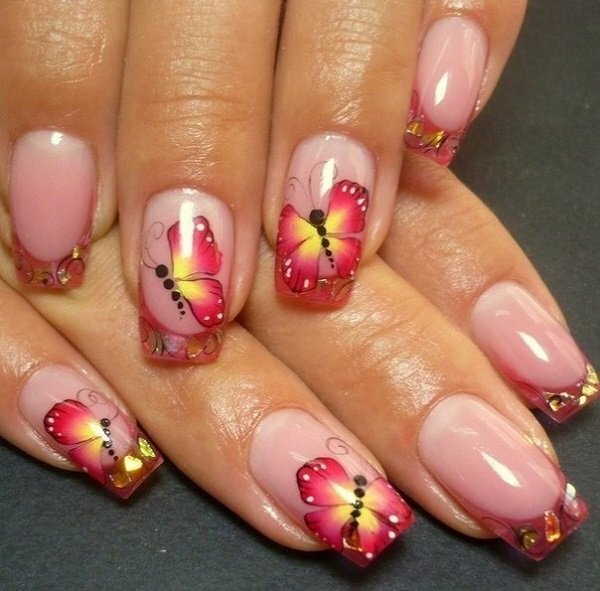 Easily one of the prettiest nail art designs would be the Butterflies Nail Art. They look absolutely stunning and can effectively give the nails a wonderful look! The best thing about this is that it isn’t as hard to paint as it looks. Make your own butterfly nail art now! All you need are a few simple and usual nail art tools. There’s no need to buy expensive tools if you can also customize your own at home. There are plenty of designs online that you can look up to follow, but you can also make one on your own. 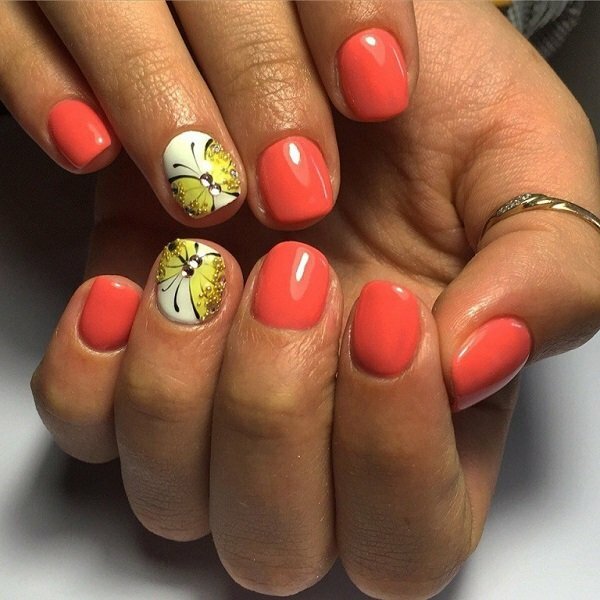 You can also combine ideas that you see from references and recreate them to something that can represent you to impose a sense of personalizing into the nail art design. However if you’re new to painting the butterfly and is unsure of what to do, you can try out the basic butterfly nil art design first. 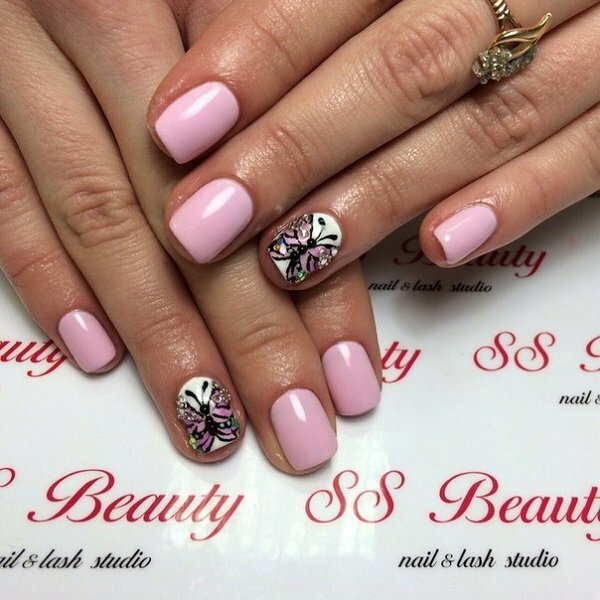 Get familiar with the design and which look best on your nails, then you can start tweaking the designs and making them more personalized or close to your taste. The best thing about Butterflies Nail Art is you can make it your own and make it unique from the rest of similar concepts. Butterflies Nail Art Beautiful marble inspired butterfly nail art. The base of the nails is coated in cream and gray colors depicting a marble like design, as a pair of butterfly wings are painted on either side of the nails as they meet together in the middle. A refreshing butterfly nail art design with French tip. The bright red and yellow colors lighten up the design as the butterfly looks as if it is glowing and hopping over from one nail on to another. 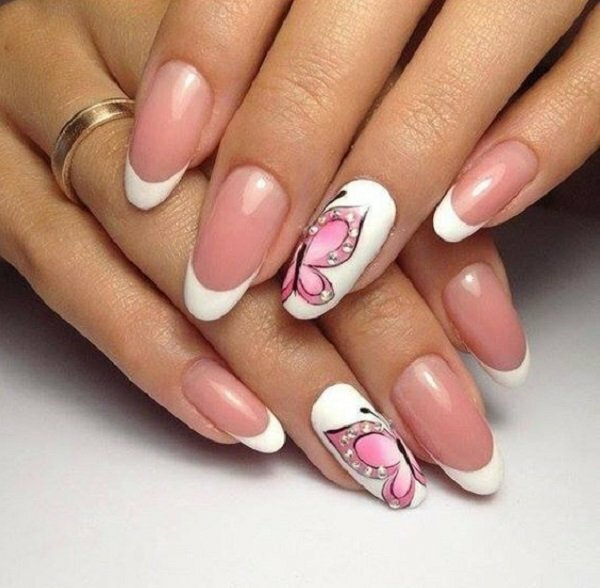 Cute looking pink and white butterflies nail art. 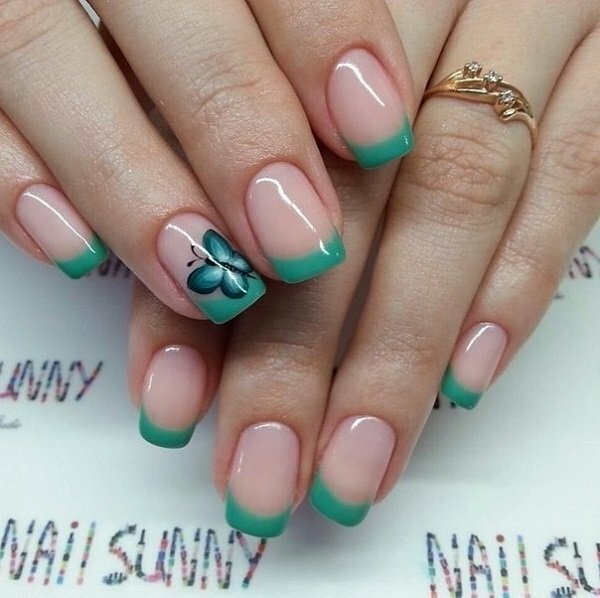 This simple yet eye-catching nail art design is perfect for those who want a minimalist effect but also a clean look on the nails. 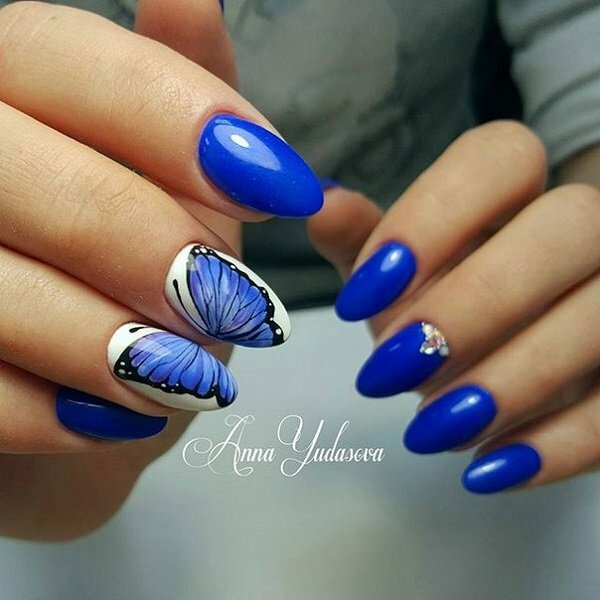 Magical looking butterfly nail art in mystic blue color. The glitter effect on the blue polish accentuates the nails and makes the French tips glow. The bedazzled butterfly embellishments on top are also gorgeous. 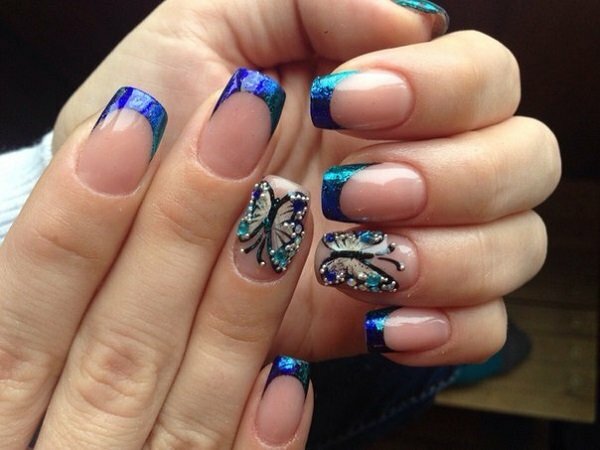 Simple and beautiful turquoise blue themed butterfly nail art. 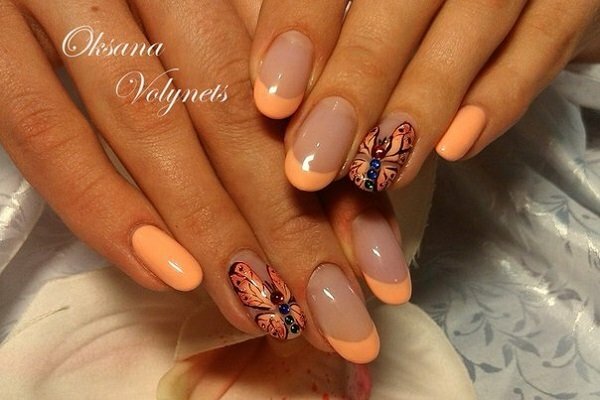 The butterfly wings are cleverly designed to fit the tips of the nails. Beautiful melon themed butterfly nail art. The French tips are in melon polish and the butterfly is painted covering the entire nail on top of a clear polish. Really cute and simple butterflies nail art. The pale yellow base color helps highlight the colorful butterfly design on top that spans its wings covering the entire nail. Enthralling butterfly nail art. The light blue colors of the design make the butterflies look magical and mystical the purple background also help emphasize the butterflies painted above it. Colorful butterfly nail art. 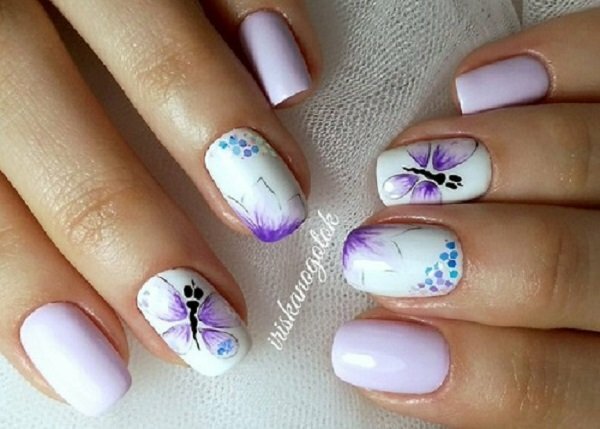 A minimalist inspired nail art design in cute pastel colors and simple butterfly designs. A French tip inspired butterfly nail art design. The baby blue colors make wonders with making the French tip design look simple and clean, the small and big butterflies painted on top also make good accents to the design.